The Taipei Cultural Center in New York is thrilled to announce the screening tour featuring a selection of works by Midi Z, the promising auteur in international cinema, will kick off Saturday June 2 at the Museum of the Moving Image in New York with the U.S. premiere of his latest documentary 14 APPLES, which was selected at the 2018 Berlinale Forum. From June 2 through June 10, taking place at the Museum of the Moving Image, Harvard Film Archive, and the Freer Gallery of Art and Arthur M. Sackler Gallery, this screening tour presents the latest survey of Midi Z’s work to date. Midi Z will be in attendance for post-screening conversations about his unique vision and minimalist aesthetics. Midi Z is a Myanmar-born and Taiwan-based director who has established himself as a vital new voice in international cinema since making his directorial debut RETURN TO BURMA in 2011. A protégé of the acclaimed director Hou Hsiao-hsien, Midi Z expands the scope and definition of Taiwan cinema by constructing films around the living and working conditions of the people from the fringes of society—migrant laborers and minority groups who risk their lives undertaking illicit work. 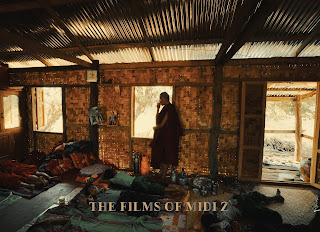 Drawing inspiration from his Burmese background and the personal experiences of his family, Midi Z addresses themes of poverty and displacement in his native country with compassion and peerless intimacy. Some of his powerful works include ICE POISON, the Best International Feature at the Edinburgh Film Festival; CITY OF JADE, which premiered at the Berlinale 2016 and nominated for Best Documentary at the Asia Pacific Screen Awards; and THE ROAD TO MANDALAY, the winner of the Fedeora Award for Best Film at Venice Days 2016. In Myanmar, a man named Wang Shin-hong is suffering from insomnia. A fortune-teller advises that he should become a monk, living in a temple and eating an apple a day for fourteen days. In this moving and personal documentary, Midi Z films the process, an experience that allows him to return to the poverty he experienced in his childhood and the religion that deeply influenced his life. Currently, Myanmar is undergoing some form of democratization; however, it is not a linear process in terms of time. As the war between the government and the Kachin Independence Army (KIA) is still going, the corporations are forced to halt their operation in the jade mines. Time seems to have frozen in this war zone while waves of poor workers flock to the area. Carrying simple digging tools, they arrive in this paradise, dreaming of getting rich overnight; none of them has ever woken from that dream. Maybe we should rewind the time back to sixteen years ago. Rumour had it that Midi’s brother found a piece of valuable jade in the paradise while his family was down to their last penny. On behalf of their parents, Midi, the youngest child in the family, wrote more than a hundred letters to his elder brother, asking him to send money home, but they never heard anything from him. It turned out that his elder brother not only spent all his money on his way home but got arrested and sent to jail for drug abuse. His hard-earned cash was squandered just like that, and Midi never forgave his brother. Later as fortune smiled on Midi, he left his home as well as poverty behind and arrived in Taiwan for his studies, learning to become a man of rational thinking. With Wu Ke-xi, Wang Shin-hong. With crop prices weak, a Burmese farmer pawns his cow for an old motorcycle so that his son can take passengers to town for extra income. The new business is fruitless until the son meets a young woman who is involved with the risky but lucrative business of transporting crystal meth. This meticulously executed and mesmerizing story captures the changes occurring in Myanmar under capitalism. The film was Taiwan’s official entry to the 2015 Academy Awards for Best Foreign Language Film. When Myanmar finally holds its first presidential election, Xing-hong, a Burmese construction worker in Taiwan, returns home with hopes that change will come to his country. Return to Burma was the first feature film shot in Myanmar. During the time of filming, Myanmar’s presidential election had just taken place. But democracy was far from thriving, and the government only allowed limited foreign press into the country. As a result, Midi Z had to shoot this semi-autobiographical homecoming story without official permission, and only minimal equipment and crew.